By the fall of 1917, a dispute between Eddie Livingstone, owner of the Blueshirts, and the owners of the NHA’s other four clubs the Montreal Canadiens, Montreal Wanderers, Ottawa Senators and Quebec Bulldogs had come to a boil. The other NHA owners were eager to disassociate themselves from Livingstone, but discovered that the NHA’s constitution didn’t allow them to simply vote Livingstone out. With this in mind, on November 22 the NHA board of directors voted to suspend operations. At the same time, the other four NHA clubs voted to created a new league the National Hockey League. However, they didn’t invite Livingstone to join them, effectively leaving him in a one-team league. However, the other club owners felt it would be unthinkable not to have a team from Canada’s second-largest city in the NHL. They also needed a fourth team to balance the schedule, since the Bulldogs were forced to suspend operations due to financial troubles and, as it turned out, wouldn’t return until 1920. 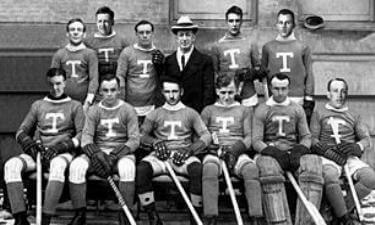 To solve the problem, NHL president Frank Calder assigned the contracts of the Blueshirt players to a ‘temporary’ Toronto franchise to be operated by the Toronto Arena Company, who also owned the Montreal Arena. Calder had ordered Livingstone to sell the team, but Livingstone turned down several offers. The Arena Company was given a year to resolve the dispute or lose the franchise. The Arena Company did agree to compensate Livingstone for the use of the players for the season, although no suitable figure was ever reached, and the league itself disputed any claims that Livingstone had on the players.